I ran across this grubby kitchen cabinet panel this week in my garage. I've had it for a while. 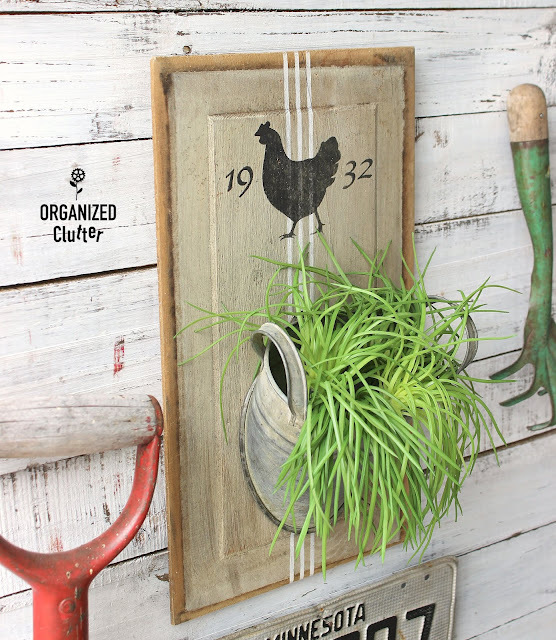 I made a vintage grater photo holder with a smaller panel like this. The panel has a crack in just the front side, that doesn't go all the way through to the back. I scrubbed the panel with a rag and hot soapy water. 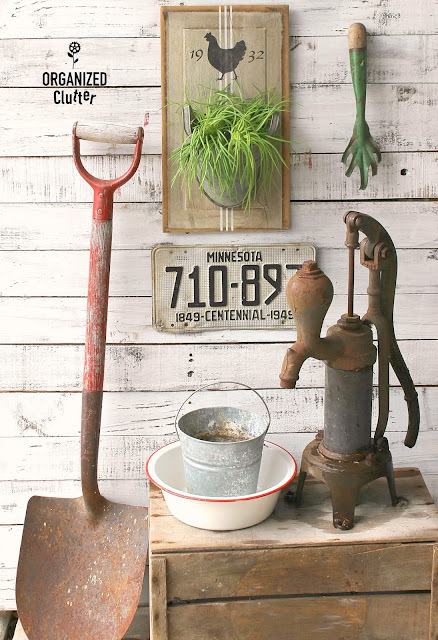 I found this rustic, vintage look metal planter at Hobby Lobby in Bemidji, Minnesota. 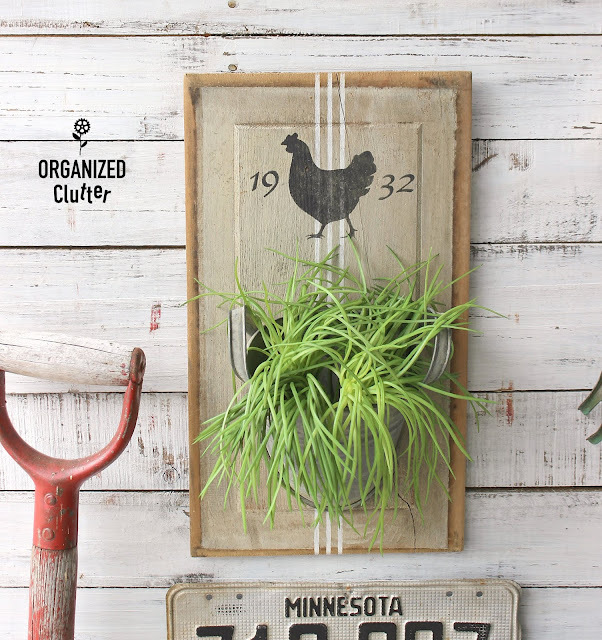 The planter is part of the Hobby Lobby's Spring Shop. It's priced at $7.99 but I know I purchased it at 40 or 50% off. I decided to add grain sack stripes on the cabinet panel, and I taped a thin three line stencil on with blue painter's tape. 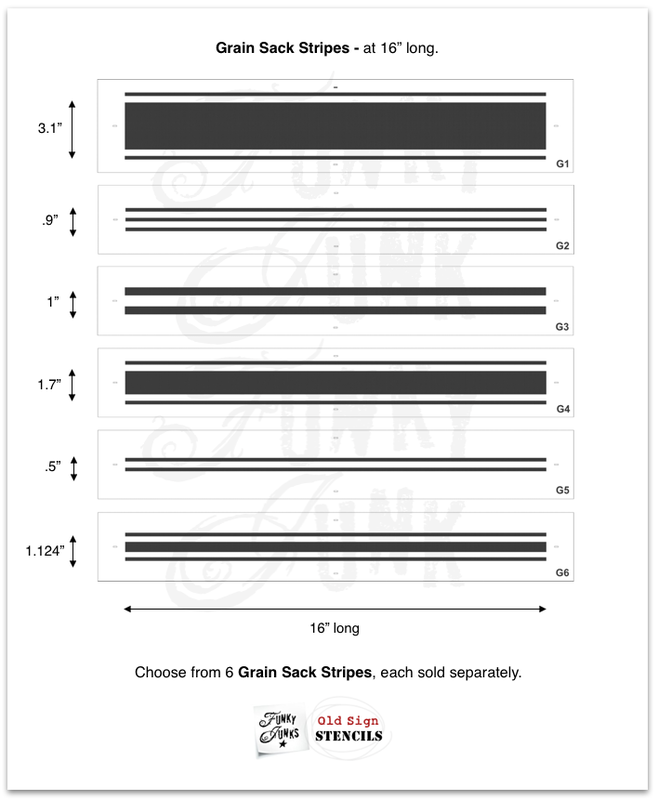 I used Fusion Mineral Paint in Champlain to stencil the stripes. All of these grain sack stripe stencil variants are available through *Old Sign Stencils. 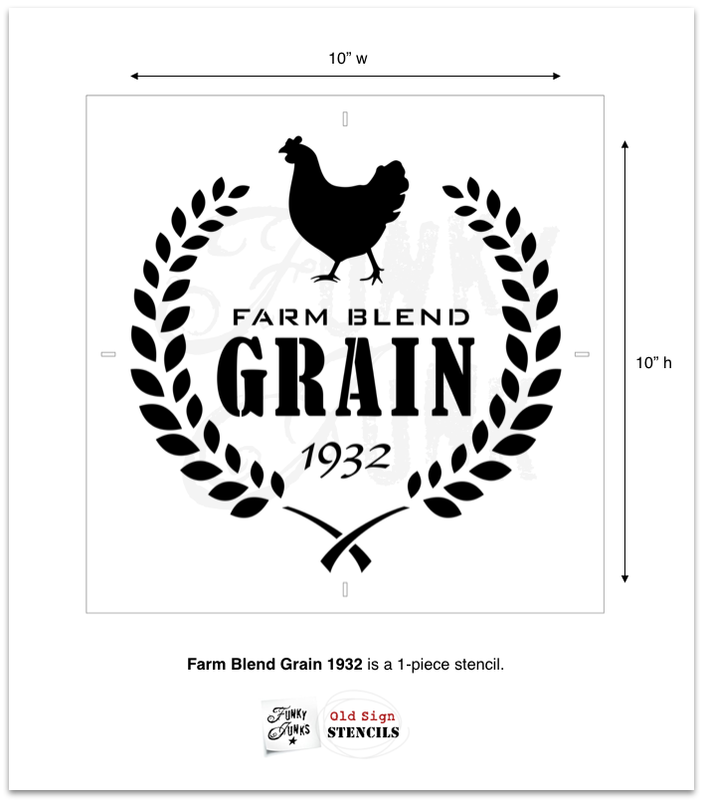 I stenciled just the "rooster" and "1932" from the *Farm Blend Grain Stencil over the grain sack stripes using Fusion Mineral Paint in Coal Black . I didn't seal the stencils or wood. Fusion Mineral Paint is self sealing. 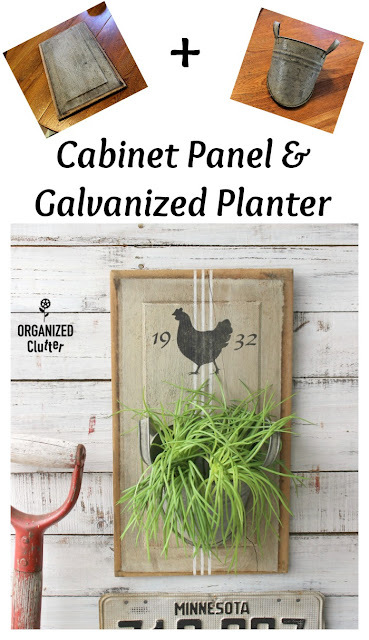 I could have pounded a nail into the cabinet panel and just hung the little planter on a nail, however, I used a screw to keep the pot in place. I added a sawtooth hanger on the back of wooden cabinet panel. 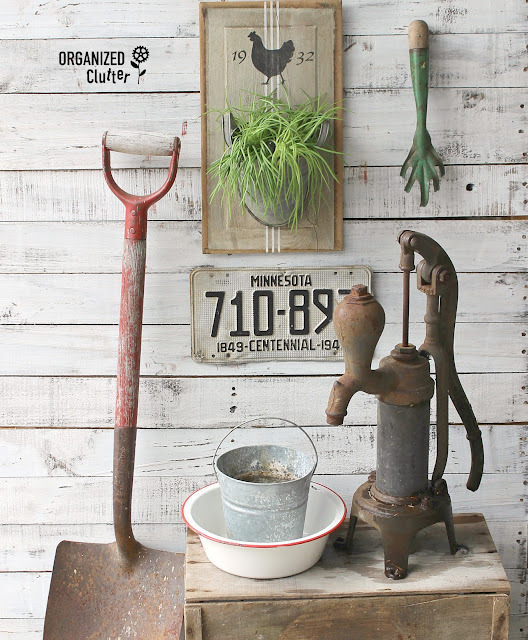 I think the planter can be used for both faux and real plants. I can't wait for all of our snow to be GONE here in northern Minnesota. I'm dreaming of garden junk! Almost any flat back galvanized planter could be used in the project. More Farm Blend Grain Stencil Projects! Turned out so nice!! Love your projects! 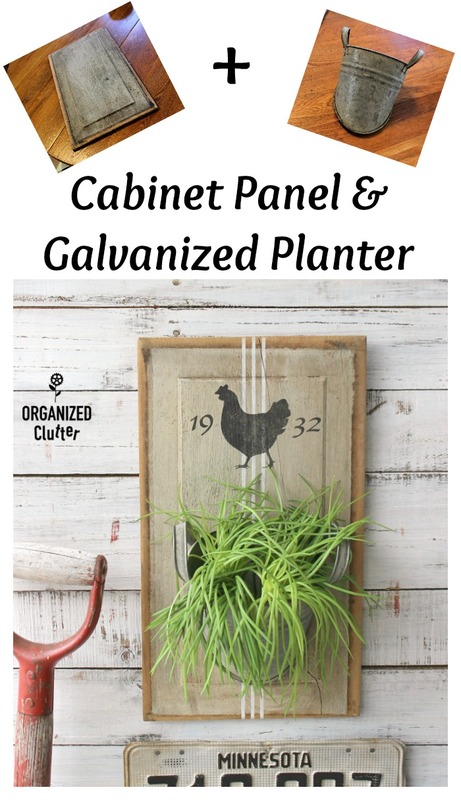 I love using cabinet doors for projects, and I adore the galvanized flat-back planter. I've not come across any flat-back planters. I love your upcycles! clever, clever! Such a cool upcycle! That came out really cute Carlene. I love the little bucket. Is there a name for that? If not could you give me the number on the label? That is so clever! 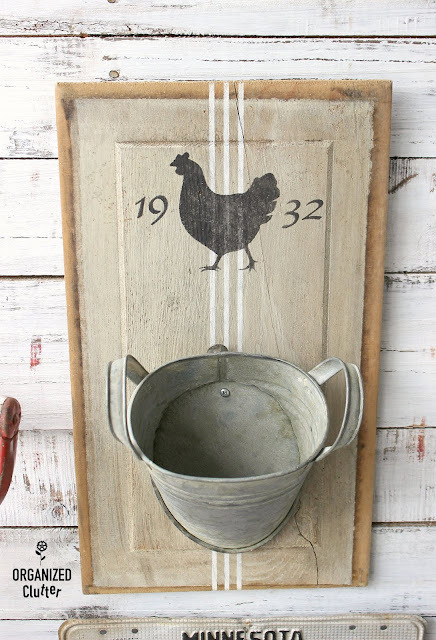 I love how you created such a useful and darling item!